In response to my post tonight about my carved tool tote, I got a question about how to start carving similar stuff. The answer I thought might be of more general interest, so I thought I’d post my answer here. The answer kind of depends on what kind of carving you want to do really, but since the question was about the stuff I have been doing I’ll answer in that regard. Scroll down a bit for the first one, it’s the best for starting out. Then follow up with the S-Scroll dvd. Absolutely top notch stuff, and very easy to understand and learn from. Reading Peter’s blog: http://pfollansbee.wordpress.com/ from start to finish. 🙂 That is if you are a geek about history and woodworking like me. Otherwise search on carving. I posted a while back about my starter set of tools, based on the recommendations of Peter Follansbee and his basic kit. this has the list of Tools I started with and how I got the list. I did about 4-5 fully carved pieces with that set before I started expanding. 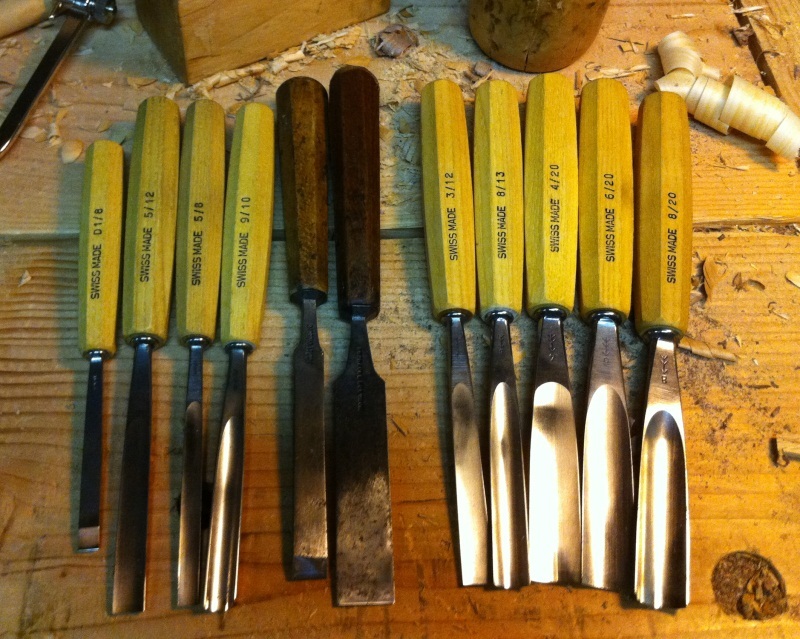 I’ve added about half dozen chisels so far, but only as I need them for specific projects. The set above is a decent starting place I figure for the kind of carving I do. It’s hard to say specifically what you’ll need since you might have a different design style in mind, but a good V tool and small variety of gouges will be a good as place as any to start. Here is part of my current kit, which I used nearly off of these for the Tool Tote carving.